Barnstaple in North Devon is known to be one of, if not the oldest boroughs in the whole of the United Kingdom. The area certainly has a rich history and many of the properties built in the 19th century still exist and are in use. It’s not uncommon for the owners of houses built in this era to discover original Victorian tiled floors and hallways. They’ve usually been covered up at some point in the past, either by carpet or linoleum, but if maintained correctly they can be a real asset to any property. I recently visited one such customer, who lives in Barnstaple, to restore a recently uncovered Victorian tiled hallway that had been tiled in a geometric pattern. 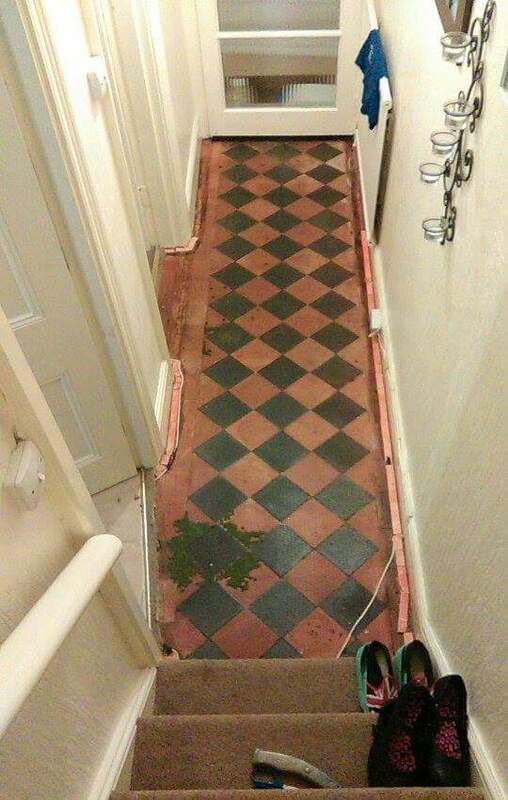 This hallway had been neglected and covered for some time by carpet so the colours had faded and there were patches of carpet underlay firmly embedded in some of the tiles. The property owner uncovered the floor after seeing a similar one in the entrance hallway of a neighbour and was thrilled with her find. After a bit of scrubbing and cleaning the customer decided to call in professional help after a recommendation for the Tile Doctor Devon from a friend. A home visit was conducted and a test patch was done to show what was possible and to talk through options. A quote was then produced which the customer was happy with and the work was arranged for the following week. As the floor was really in quite a bad state, I opted to use Tile Doctor NanoTech HBU as my main cleaning product. HBU stands for ‘Heavy Build-Up’ – and that’s exactly what the product is formulated to tackle: heavy build-up of ingrained dirt and soil. It used nano-sized cleaning particles to penetrate deep into the pores of the stone and get underneath stains to lift them to the surface. I applied NanoTech HBU to the entire hallway and left it to dwell for several hours, before scrubbing it as thoroughly as possible with a brush fitted to a rotary cleaning machine. The soil that was brought to the surface was subsequently rinsed away with fresh water and the resulting slurry was extracted using a wet vacuum. Once finished with the cleaning process, I left the floor to dry out completely. This was important as older floors which lack a damp proof membrane can suffer from moisture issues, and these issues can damage the performance of the sealer. Thankfully there were no problems with drying the floor. I was able to seal the tiles using a colour-enhancing impregnating sealer from our range, known as Tile Doctor Colour Grow. For extra protection – and to provide the finish the customer had requested – I also applied a topical sealer called Tile Doctor Seal and Go. This left the floor with a high-quality, long-lasting satin finish. A properly sealed floor will be much more resistant to stain as well as easier to clean. As with every job a cleaning and maintenance guide was provided which gives handy tips and do’s and don’ts for the floor and that particular sealer. The restoration reinstated this great Victorian tiled hallway as the showpiece upon entering the property and the customer was absolutely thrilled. You can see the final result below. 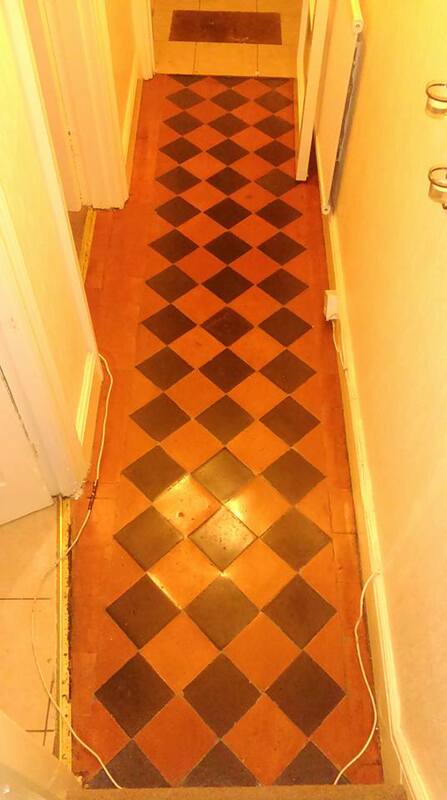 This entry was posted in Victorian Posts and tagged Barnstaple, Devon, Floor, Geometric, hallway, Neglected, restoration, tile, victorian by AbzDominise. Bookmark the permalink. Stuart Tomlin is an agent of Tile Doctor, the largest Tile and Stone cleaning network in the UK who have developed the products and techniques to handle a multitude of issues surrounding tile restoration including stone and grout.